Proprietary Name: Zerviate What is the Proprietary Name? Non-Proprietary Name: Cetirizine What is the Non-Proprietary Name? Zerviate with NDC 71776-024 is a a human prescription drug product labeled by Eyevance Pharmaceuticals. The generic name of Zerviate is cetirizine. The product's dosage form is solution, gel forming / drops and is administered via ophthalmic form. Dosage Form: Solution, Gel Forming / Drops - A solution, which after usually being administered in a drop-wise fashion, forms a gel. FDA Application Number: NDA208694 What is the FDA Application Number? 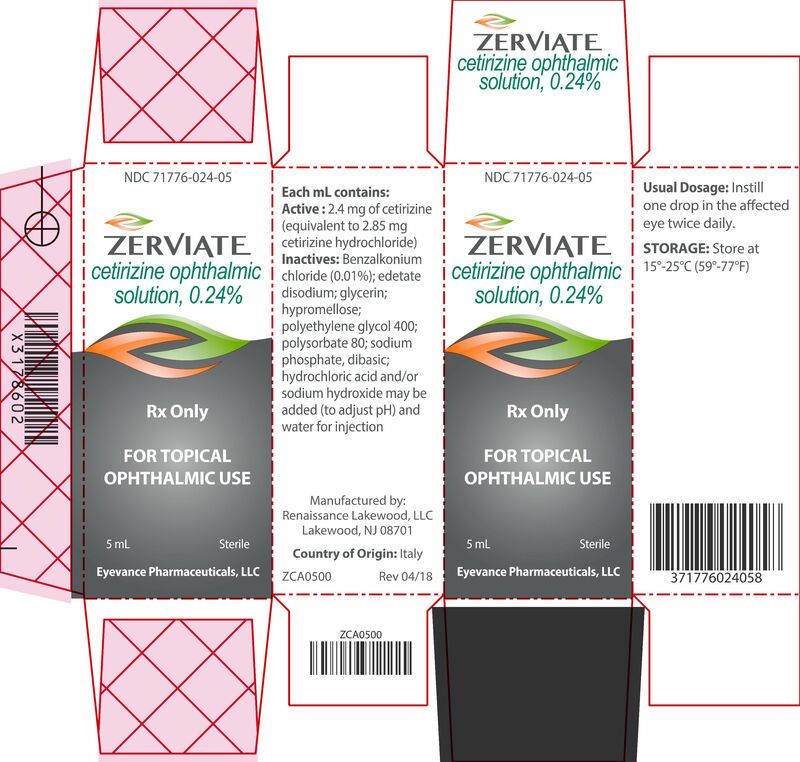 ZERVIATE™ (cetirizine ophthalmic solution) 0.24% is indicated for the treatment of ocular itching associated with allergic conjunctivitis. The recommended dosage of ZERVIATE is to instill one drop in each affected eye twice daily (approximately 8 hours apart). Cetirizine ophthalmic solution, 0.24% is a sterile, buffered, clear, colorless aqueous solution containing cetirizine 0.24% (equivalent to cetirizine hydrochloride 0.29%). As with any eye drop, care should be taken not to touch the eyelids or surrounding areas with the dropper tip of the bottle to prevent contaminating the tip and solution. Keep the bottle closed when not in use. Patients should be advised not to wear a contact lens if their eye is red. ZERVIATE should not be instilled while wearing contact lenses. Remove contact lenses prior to instillation of ZERVIATE. The preservative in ZERVIATE, benzalkonium chloride, may be absorbed by soft contact lenses. Lenses may be reinserted after 10 minutes following administration of ZERVIATE. Because clinical trials are conducted under widely varying conditions, adverse reaction rates observed in the clinical trial of a drug cannot be directly compared to rates in clinical trials of another drug and may not reflect the rates in practice. In seven clinical trials, patients with allergic conjunctivitis or those at a risk of developing allergic conjunctivitis received one drop of either cetirizine (N=511) or vehicle (N=329) in one or both eyes. The most commonly reported adverse reactions occurred in approximately 1–7% of patients treated with either ZERVIATE or vehicle. These reactions were ocular hyperemia, instillation site pain, and visual acuity reduced. There were no adequate or well-controlled studies with ZERVIATE™ (cetirizine ophthalmic solution) 0.24% in pregnant women. Cetirizine should be used in pregnancy only if the potential benefit justifies the potential risk to the fetus.
. Comparable bioavailability has been found between the tablet and syrup dosage forms. However, it is not known whether the systemic absorption resulting from topical ocular administration of ZERVIATE could produce detectable quantities in human breast milk. There is no adequate information regarding the effects of cetirizine on breastfed infants, or the effects on milk production to inform risk of ZERVIATE to an infant during lactation. The developmental and health benefits of breastfeeding should be considered along with the mother’s clinical need for ZERVIATE and any potential adverse effects on the breastfed child from ZERVIATE. The safety and effectiveness of ZERVIATE has been established in pediatric patients two years of age and older. Use of ZERVIATE in these pediatric patients is supported by evidence from adequate and well-controlled studies of ZERVIATE in pediatric and adult patients. Each mL of ZERVIATE contains an active ingredient [cetirizine 2.40 mg (equivalent to 2.85 mg of cetirizine hydrochloride)] and the following inactive ingredients: benzalkonium chloride 0.010% (preservative); glycerin; sodium phosphate, dibasic; edetate disodium; polyethylene glycol 400; polysorbate 80; hypromellose; hydrochloric acid/sodium hydroxide (to adjust pH); and water for injection. ZERVIATE solution has a pH of approximately 7.0 and osmolality of approximately 300 mOsm/kg. 1 histamine receptors. The antihistaminic activity of cetirizine has been documented in a variety of animal and human models. ex vivo animal models have shown negligible anticholinergic and antiserotonergic activity. In vitro receptor binding studies have shown no measurable affinity for other than H1 receptors. max of 1.7 ng/mL following a single dose and 3.1 ng/mL after twice-daily dosing for one week. The observed mean terminal half-life of cetirizine was 8.6 hours following a single dose and 8.2 hours after twice-daily dosing of ZERVIATE for one week. 2 basis). The clinical significance of these findings during long-term use of cetirizine is not known. in vivo micronucleus test in rats. Cetirizine was not clastogenic in the human lymphocyte assay or the mouse lymphoma assay. The efficacy of ZERVIATE was established in three randomized, double-masked, placebo-controlled, conjunctival allergen challenge (CAC) clinical trials in patients with a history of allergic conjunctivitis.Onset and duration of action were evaluated in two of these trials in which patients were randomized to receive ZERVIATE or vehicle ophthalmic solutions. Patients were evaluated with an ocular itching severity score ranging from 0 (no itching) to 4 (incapacitating itch) at several time points after CAC administration. Table 1 displays data from the mean ocular itching severity scores after ocular administration of an antigen using the CAC model. A one unit difference compared to vehicle is considered a clinically meaningful change in the ocular itching severity score. 1 Treatment difference values shown are the group mean active minus the group mean vehicle at each post-CAC time point. Storage: Store at 15°C to 25°C (59°F to 77°F). •Risk of Contamination: Advise patients not to touch dropper tip to eyelids or surrounding areas, as this may contaminate the dropper tip and ophthalmic solution. Advise patients to keep the bottle closed when not in use.•Concomitant Use of Contact Lenses: Advise patients not to wear contact lenses if their eyes are red. Advise patients that ZERVIATE should not be used to treat contact lens-related irritation. Advise patients to remove contact lenses prior to instillation of ZERVIATE. The preservative in ZERVIATE solution, benzalkonium chloride, may be absorbed by soft contact lenses. Lenses may be reinserted ten minutes following administration of ZERVIATE.ZPI0000 Rev 06/2018Distributed by:Eyevance Pharmaceuticals, LLC.